Kathi Appelt 2013: Simon & Schuster, Inc.
Kathi Appelt knows the swamp and she can guide the most North Eastern New Englander, through the forested wetlands of Louisiana. A few pages in and you will see the golden eyes of a peering gator; smell the fast drying dampness of the moss-draped canopy, and hear the slow sounds of the decaying baldcypress. 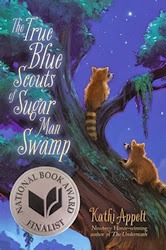 In The True Blue Scouts of Sugar Man Swamp there are a lot of characters and natural beauty to root for. By writing in third-person omniscient narration (where the teller of the tale appears to be the author and they assume an all-knowing perspective on the story being told) the reader gains a multi-lens insight about swamp-ecology and an extended stay into the culture and heartbeat of the people who call it home. This story weaves the soul of memories and the whisper of stories once told with the sweet sugar smells of pure canebrake sugar fried pies and a twelve-year old boy who wouldn’t dream of letting developers destroy everything he knows and has yet to have the time to learn. Did I mention Bingo and J’Miah? The two raccoons that live in a half mud sunk rusted 1949 DeSoto?